And the calendar calls it March. The scientific definition of the beginning of spring occurs with the vernal equinox (March 20). But, locally, we have experienced snowfall on the running of five Boston Marathons (1907, 1908, 1925, 1961, and 1967) and two Boston Red Sox games in Fenway Park were snowed out on April 8th and 10th in 1996. Boston had a half-inch of snow on May 10, 1977. This year, we place great hope in Lowell’s poetic weather prognostication. For many of us, the lovely sights of the first flowers opening from bulbs are our own “signs of spring”. Flowering bulbs, corms, and tubers, which are modified perennial, herbaceous plants, are currently, or soon will be, offering spring delights for many visitors, in numerous locations, throughout our landscape. 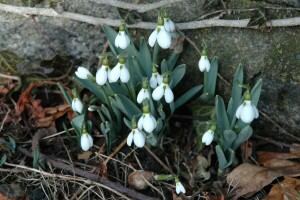 Galanthus nivalis, snowdrops, are the earliest to flower annually, and some have been in bloom for weeks now. Galanthus, is from the Greek gala for milk and anthus for flower. There are about 20 known species, and nivalis in Greek, means “of the snow”. 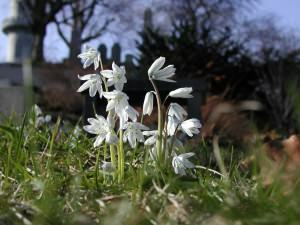 Appropriate, as these small, white, flowers are often in bloom with lingering snow still around them. Modern interpretation into Homer’s (850 BC) Odyssey, suggests that a compound, galantimine, from this plant, was the mysterious, effective antidote to the goddess Circe’s magical potions, which had turned many men into animals. Nonetheless, galantimine today can be helpful in the treatment of Alzheimer’s disease. Snowdrops may be found in numerous locations. Puschkinia scilloides, striped squill, in name, honors the Russian botanist, Apollo Mussin-Pushkin (1760-1805). These 6-inch-high plants have white flowers, with six, 1/2 -inch petals, each striped down the middle in blue, giving an overall light-blue appearance. 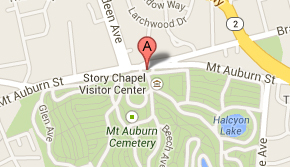 You will find these on Magnolia Avenue, near Mountain Avenue. Eranthis hyemalis, winter aconite, is actually a tuber, as opposed to bulbs or corms. All these plants with underground storage of energy are called geophytes in the wider classification system. These cup-shaped, upward-facing, bright, yellow flowers are in the buttercup family, Ranunculaceae. These are welcome flowers for the earliest bees. 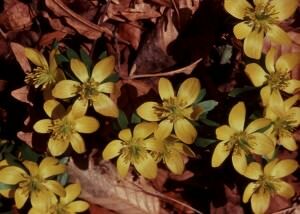 These flowers are good self-seeders, helping to gradually increase the clump size of many winter aconite plantings. As with the previously discussed plants, these will go dormant by late spring. You may find a nice planting of these on the west side of Chestnut Avenue, near Palm Avenue. 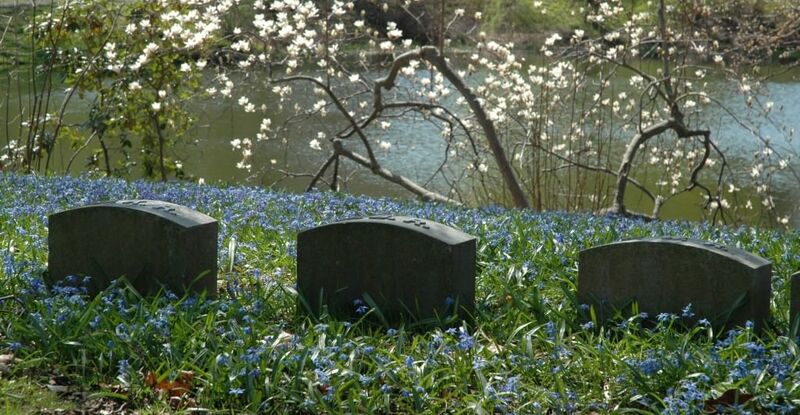 Chionodoxa luciliae, Glory-of-the-snow, with its bluish-white flowers may often be confused with the darker-blue Scilla siberica, Siberian squill. One helpful difference to look for when seeking to discern or separate these two bulbous plants, are the position of the flowers. Generally the six-petal, flowers of Glory-of-the-snow face upwards, with a white center, tinged with blue on the outer edges. 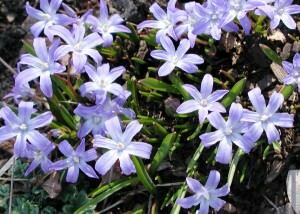 Scilla siberica, Siberian squill flowers are distinctly nodding, hiding the flower centers, and of a dramatic, darker, color. Along Cedar Avenue you may find plantings of these two different flowers, blooming at the same time, and you will see the difference described herein. 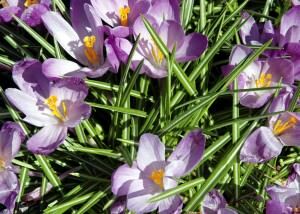 Finally, we mention perhaps the most popular of early spring flowers, the Crocus. With the botanical and common name the same, Crocus, there are about 80 species in this genus. They are native to Central Asia, Europe, Middle East, and North Africa. The commonly available varieties of purple, yellow, and white, cup-shaped flowers have been used over the millennium. Indeed, one species related to our garden favorites, Crocus sativus, saffron crocus, (although not grown here) was an authentic plant mentioned in the Bible, “Spikenard and saffron;…with all the trees of frankincense: myrrh and aloes, with all the chief spices…” The Song of Solomon 4:14. You may find plantings of Crocus around the entrance of our main gate. 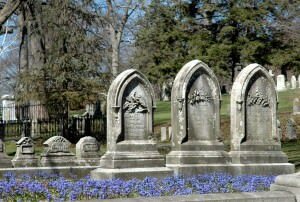 Enjoy these signs of spring on your next visit to Mount Auburn.